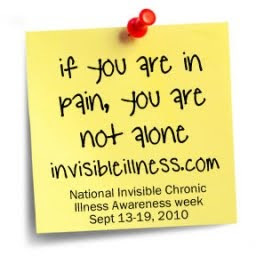 This week is Invisible Illness Awareness week. You may remember some of my posts from last year: a Hide-and-Seek of sorts and a Diabetes Meme. I have made many efforts since September 2009 to increase awareness and "visibility" of this disease. One, being this blog and it's integrated Type 1 Diabetes content. Second, slipping in D-content into my everyday conversations. And third, walking for JDRF in October. I have learned that Diabetes requires a careful balance between visibility and invisibility. Yes, you want to show off your cool insulin pump, but no, you do not want to get hassled going through airport security (thank you convenient bra clip). You want co-workers to know you have it in case of an emergency, but you do not want them to label you, "that Nerdy girl with Diabetes." You love that super great absorption from an arm pump site location, but you hate being wardrobe restricted for half a week. You love educating people about Type 1, but you are still learning how to deal with people that assume. It even extends beyond me. Several years ago during what I like to call my "Diabetes meltdown phase" my mom had to choose between making another Diabetic's story visible to me (she had read the book Sweet Invisible Body) or leaving it invisible (of course the book is not exactly rainbows and unicorns). I read the entire thing in one day, spent the next day crying, and have become more involved in the Diabetes community ever since. For me personally, Diabetes has become a much more "visible" part of my life lately. I had to grow up and trust that I would not be judged by my disease (except by the freaking FAA!). And in some ways, I know I am still judged, not because I have Type 1.....but because I am able to handle the extra burden with grace, and as Kerri says, "without Diabetes defining me." It is a careful balance, us PWD (persons with Diabetes) know. Einstein said, "Life is like riding a bicycle - in order to keep your balance, you must keep moving." And we in the D-community keep moving forward together with advocacy, science, and knowledge in order to keep our balance both visibly and invisibly.